It’s back! The list that every company wants to be on. The results you see here are based on confidential employee surveys as well as a company’s level of employee participation. For example, if a company scores well in the 10 categories described below but has low employee participation, it doesn’t do as well in the rankings as a company with similar scores and a much better participation rate. The research firm Fieldwork Webwork compiles and ranks the detailed responses of thousands of employees who rate their firms anonymously in these categories: benefits, communication, corporate culture, hiring/retention, executive leadership, performance standards, responsibility/decision making, rewards/recognition, training/education and workplace environment. 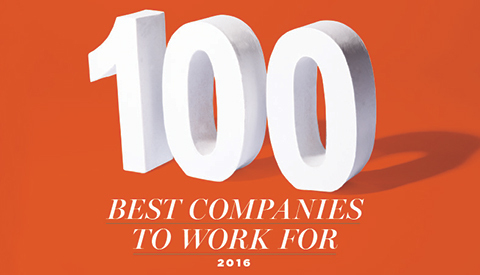 The list notes the category or categories in which each company has scored highest. Personal-injury law firm with offices in Seattle, Bellevue, Everett and Kent. Recruiting and staffing firm specializing in the financial, commercial, health care and technology sectors. On-demand marketplace designed to make finding and booking a professional photographer convenient. Architecture firm focusing on custom residential, retail, commercial and multifamily projects. Read more about Board & Vellum here. Nationally accredited cosmetology school providing training at campuses in Everett, Bellevue and Renton. Staffing firm hiring for administrative, customer service and clerical roles in the Puget Sound region. Hybrid clinic blending traditional physical therapy, sports chiropractic and sports medicine. Read more about Kinetic Sports Rehab here. Law practice emphasizing resolution of complex business disputes via trial, arbitration and mediation. Microsoft Gold Certified partner helping businesses with Office 365 solutions, including email and SharePoint. Media company that partners with top brands to publish apps and provide mobile advertising. Provider of flooring and other interior finishes in seven Western states. User-experience design firm specializing in research for websites, mobile apps and other digital products. Social marketing and public relations firm with offices in Seattle, Portland, Boston and Washington, D.C.
Technology services and software product engineering firm developing cloud-based platforms. Startup developing metamaterials-based, high-performance radar for drones, robots and self-driving cars. Professional services firm specializing in customer relationship management solutions. Collector and disseminator of data gleaned through crowdsourced information provided by smartphone users. Digital media services firm specializing in capture of content from live events and distribution for later use. Developer of software for financial management, accounting and enterprise resource planning. Staffing firm specializing in placing technology professionals. Startup providing automation tools that help sales representatives operate more efficiently. Leadership development and training company. Free classified advertising site serving the U.S.A., Canada, Australia, India, Mexico, the Caribbean and the U.K.
Largest independent recruiting and staffing firm in the Inland Northwest. Maker of Atlas Recall, a personal search engine that makes finding content across multiple devices easier. Web design and development agency. Lead-generation and management company specializing in leads driven through internal technology. Full-service branded merchandise and apparel agency. Agency representing American Income Life Insurance Co., with affiliate offices in 18 states and seven provinces. Builder of customized apps for salespeople in the mortgage, real estate and insurance sectors. Online resource for sharing information about cosmetic surgery, dentistry and other elective treatments. Read more about RealSelf here. 6. Pacific Capital Resource Group Inc.
Financial services firm serving business owners, professionals and families. Management consulting firm centered on eight core values. Read more about Prime 8 Consulting here. Management consulting firm that focuses on solving business and technology problems. Credit card payment processing company. Consulting company focused on strategizing and executing end-to-end technology solutions. Technology product design and development consulting firm defining next-generation products and user experiences. Worldwide provider of cloud management solutions for information-technology clients. Designer and developer of user-experience products across multiple digital platforms. Services firm with expertise in project and construction management and forensic architecture/engineering. Maker of computational fluid dynamics (CFD) visualization and analysis software for engineers and scientists. Creator of innovative financing solutions for people seeking to start businesses with their retirement funds. Online marketplace where people can buy and sell goods and services locally in a safe environment. Designer of employee experiences for employers, brokers and health systems. Consulting firm that works with technology companies and suppliers on sales, marketing and channel innovations. Wealth management and financial planning firm. Management consulting firm offering business analysis, project management and process improvement. Commercial bank dedicated to meeting the needs of small and midsize businesses. Design and strategy consultancy specializing in medical products and consumer electronics. Provider of cloud solutions that simplify and improve IT functions. Read more about BitTitan here. Online database providing estimated home values and other real estate and rental information. Builder of products that store, manage, retrieve and curate data. Direct lender providing home loans and related services in seven Western states. Maker of workflow automation software, with more than 5,000 customers in 90 countries. Helps small businesses grow through mobile and online advertising and marketing. The leading provider of personal and business contact information in North America. Strategy-driven, full-service digital advertising/marketing agency. Financial institution for 110 years, with eight offices in Thurston and Mason counties. Washington state’s oldest bank, with offices in Walla Walla, Kennewick, Yakima and Milton-Freewater (Oregon). Online travel company featuring brands such as Expedia, Hotels.com, Orbitz, Travelocity and Trivago. Clinical-stage company developing monoclonal antibody therapeutics. Insurance company providing property/casualty coverage in Washington, Oregon, Idaho, Utah and Arizona. Largest independent analytics consulting company in the United States. Online community where people can find dog sitters, dog walkers, dog daycare, etc. Technology company creating platforms to inspire workers to improve their health and performance. Global software-as-a-service business providing services and apps pertaining to road traffic. Hospitality consulting company specializing in management of conference centers and boutique hotels. Provider of in-home health care services to residents of eastern Washington and northern Idaho. Digital advertising, marketing and creative design agency with offices around the world. Research firm providing data to the private equity and venture capital sector. Read more about Pitchbook here. Credit union founded in 1933 with membership open to anyone who lives or works in Washington state. Electrical and data-systems contractor founded in 1987. A team of builders and craftsmen with a deep appreciation for the opportunity to work with clients and architects to create memorable, unique homes. Family-owned food distributor serving convenience stores, universities, restaurants and other institutions since 1923. Specialist in automating manual processes such as roof and wall measurements for builders and insurers. Software-as-a-service business providing performance analytics to mobile marketers. Provider of hardware and software products that deliver computer network applications rapidly and securely. Consulting firm providing business management and IT solutions that bridge the gap between strategy and delivery. A Boeing business jet completion center providing interior completions for private clients and heads of state. Employee-owned international wealth management firm. Home office: Milwaukee, WI. Provider of website domain registry services. Home office: Scottsdale, AZ. Read more about Navy Federal Credit Union here. Investment and financial services provider. Home office: St. Louis, MO. Luxury hotel properties in downtown Seattle. Home office: Chicago, IL. Planning, surveying and civil engineering firm with 25 offices in eight states. Home office: Anchorage, AK. Subscription-based streaming TV service. Home office: Santa Monica, CA. Read more about Hulu here. 8. COWI North America Inc. Designer and builder of bridges, tunnels and marine facilities. Home office: North Vancouver, B.C. Global pharmaceutical and health-care treatment company. Home office: Bagsvaerd, Denmark. Business and technology consulting firm. Home office: Chicago, IL. Global management consulting firm. Home office: Atlanta, GA.
General construction contractor. Home office: Portland, OR. Residential mortgage lending company with offices nationwide. Home office: Tustin, CA. Architecture firm whose portfolio encompasses housing, offices, hospitality and retail. Home office: Portland, OR. Designer of electrical power systems for aircraft and missiles. Home office: East Aurora, NY. Provider of accounting and management consulting services. Home office: London, U.K. Provider of banking and financial services. Home office: Eugene, OR.